The amount of effort put into a project's initiation lays the groundwork for all the work that follows. Learn six activities every project manager perform at initiation to ensure the project starts (and finishes) strong. Note: This article was originally published on StickyMinds.com as "11 Ways Agile Adoptions Fail. "This updated version includes additional information that explains why some agile adoptions that appear to have failed may never have been truly agile to begin with. While "testing" is part of its name, many TDD pundits insist TDD is not a testing technique, but rather a technique that helps to focus one's design thinking. Drawing on real events from the authors' combined experience, this story follows a fictional team as it encounters some of the pitfalls of using test-driven development. Have you ever found a major defect while testing an unfamiliar system and been unable to explain exactly how you found it? The Framework for Exploratory Testing can help. These four activities help you explain your thought processes and allow you to train others to be better exploratory testers. 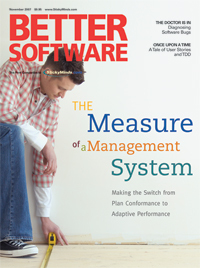 Traditional management systems were designed to measure conformance to plan, not adaptability. So in order to achieve truly agile, innovative organizations, a change in our approach to performance management systems is necessary. Find out why a switch to an adaptive performance management system can unleash the full potential of agile methods. Contrary to popular belief, object orientation is not the One True Paradigm--there isn't one, each programming style has its own claim to fame, and one is not necessarily better than another. So, even more important than being proficient in multiple languages is the addition of multiple paradigms to your development arsenal. People think in models and metaphors, which help us make sense of the world and deal with new things. Citing material from the book "How Doctors Think", Michael draws a comparison between how doctors diagnose illness in patients and how testers find problems in software. When a team decides to go agile but its management fails to acknowledge the changes to each team member's role and provide support during the transition, frustration ensues. Find out how recognizing the needs of each new role can help smooth the way to a successful agile adoption.